The holidays have arrived in Jianghu, and we're very excited to announce our first ever Age of Wushu Dynasty Christmas community event! 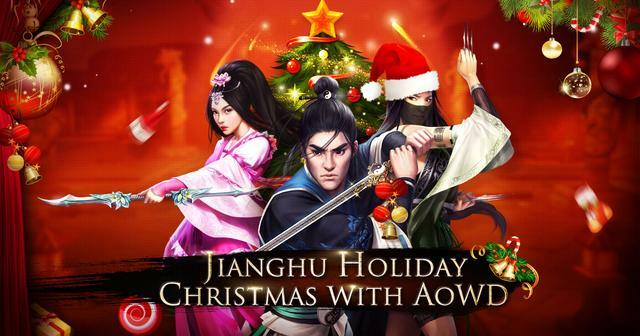 Join with masters from all over the world, from veterans to newcomers and those already enjoying to those waiting patiently for global OB, in a special holiday event - Jiang-holidays with Age of Wushu Dynasty! Here's how it works - snap a picture of how you're spending the holidays and share it with the community! Whether you're spending the holidays with family or enjoying the time with friends, playing in the snow or relaxing on the beach, we at Age of Wushu Dynasty would like to share this time with you! Post a picture on our Event Submission Thread along with a little bit about yourself and how you're spending the holidays. All those who submit will be recorded, and we'll choose up to 20 lucky individuals who do to be awarded with a special bonus of Christmas pack at full release of the game! The team at Age of Wushu Dynasty reserves the right to reject and/or delete any submission we find inappropriate or not in line with the idea of the event. Please be respectful of other submissions, and maintain a positive atmosphere for the community. One valid submission allowed per account. The Gift Code rewarded is redeemable at the Gift Center of our official website for players with a Snail Account. Code is redeemable once per account.